Introducing the CAMA Family Chaise Sleeper – the newest piece in the CAMA Healing Touch Collection by IOA Healthcare Furniture. 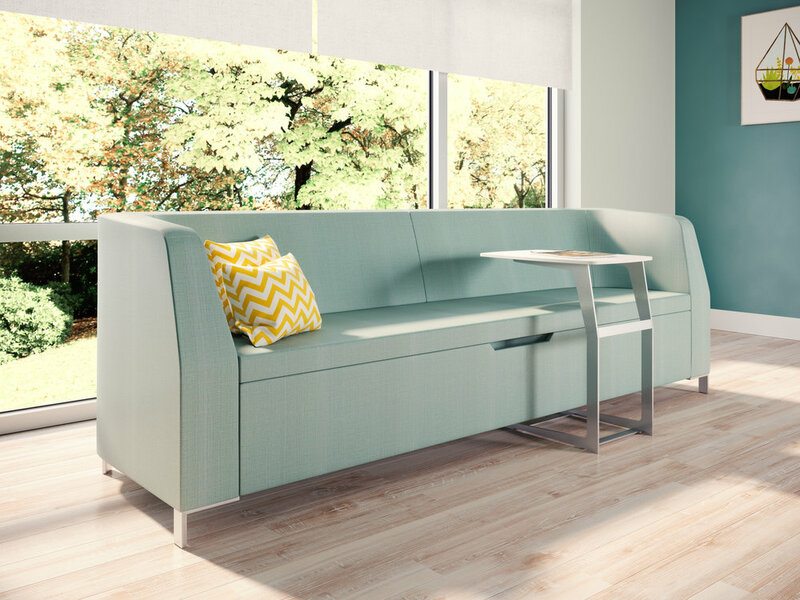 This simple and easily convertible Chaise sleeper was designed to enable comfortable family engagement during a loved one's hospitalization. Most families have little opportunity to relax and feel at ease during this stressful period. Current furniture provided in patient rooms inhibit the ability for family members to fully engage with their hospitalized loved one, limiting a proven method of accelerating the healing process – physical touch. The CAMA Family Chaise Sleeper cradles family members in a comfortable nook that converts from a chaise by day to a sleeper by night. Like the CAMA Bed Chair, the Chaise Sleeper enables critical engagement between patient and loved ones. Engineered to allow multiple seating positions such as side-sitting and lounging, the height and angle of the back creates a supportive hug-like sitting position, while the angle of the chaise position promotes eye contact with the bedridden patient. With the ease of a front pull release, the seat deck slides out to the needed Chaise Sleeper depth. Families are encouraged to engage in active communications with the patient as well as with the other visiting family members. This seating configuration promotes “cuddle time” an act of comfort that has been supported by research to help people release stress and anxiety during intense recuperative periods. Because of the variety of comfortable positions, families can also provide company to the patient while maintaining daily activities such as working or reading. The CAMA Healing Touch Collection addresses the need for personal touch between patients and loved ones through beautifully designed furniture pieces. The design of the Chaise Sleeper masks the depth of the seat cushion needed for comfortable seating, lounge or sleep positions. The additional seat depth is housed by a back garage, hidden by a drop accessory shelf. This attention to detail allows the CAMA Family Chaise Sleeper to present as an elegantly styled alternative to the mechanically configured sleep sofas currently on the market. The CAMA Family Chaise Sleeper by IOA is engineered to be developed in various sizes, side arm configurations and can be paired with a variety of convenience accessories. The garaged seat depth allows for a back sill that accommodates a convenience shelf for drinks and various sundries. Power and data ports are available as is a unique lighting fixture that creates a hug of light in the focal area of a recuperating patient. Side task tables are also available in the collection for dining and task related activities. The CAMA Family Chaise Sleeper is engineered to be devoid of complex mechanics through its simple slide that extends and locks the seat depth. A central locking mechanism for its rolling caster base allows for a facility’s ease in cleaning and flexibility in room reconfigurations. This is the second piece in the CAMA Healing Touch Collection, a growing hospital patient room collection for IOA Healthcare Furniture.